This exciting event, the first of our health and healthcare public lecture series, took place on Wednesday 10 February 2016 at the King's Fund, London, and focused on public health. 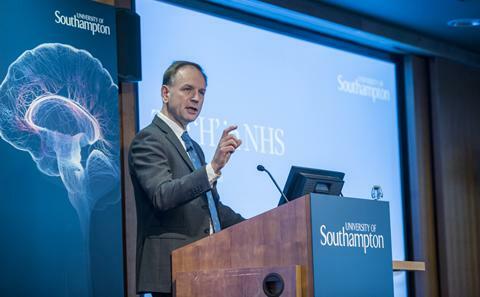 Keynote lectures from Simon Stevens, Professor Sir Michael Marmot and Professor Cyrus Cooper preceded a panel discussion on how the University of Southampton is influencing public health and driving cross sector collaboration. Simon Stevens, Chief Executive, NHS England – Appointed as Chief Executive of NHS England in April 2014. He was responsible for the Five Year Forward View produced by NHS England in October 2014. Professor Sir Michael Marmot, Director of the Institute of Health Equity at UCL – Author of The Health Gap: the challenge of health in an unequal world. Led research groups on health inequalities for over 35 years. He was Chair of the Commission on Social Determinants of Health (CSDH), which was set up by the World Health Organisation in 2005. Professor Cyrus Cooper, Director & Professor of Rheumatology, MRC Lifecourse Epidemiology Unit – Vice-Dean for Medicine at the University of Southampton, his research addresses the causes and prevention of musculoskeletal ageing throughout the lifecourse; major discoveries include the developmental origins of osteoporosis, and the benefits of maternal vitamin D supplementation during pregnancy. Watch our interviews recorded after the event with key figures and hear their views on this exciting and challenging field.